Quakers exist neither for themselves nor by themselves alone. Therefore, they ought not to construct Quaker theologies but rather quaker (verb) theology-to add their fingerprints to the larger conversation. David Johns contributes to a Quaker way of thinking theologically but also invites others to think through their denominational identities into a more expansive and ecumenical space. 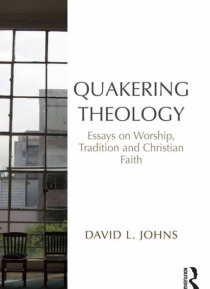 Placing … contemporary Quaker thought in conversation with the wider theological tradition, Johns shows that Quakers have something important to contribute to the wider Christian family and he demonstrates how other groups may enter this conversation as well. Some themes explored may not spring immediately to mind as 'Quaker themes'-the saints, C.S. Lewis, sacraments, ritual, and Shakespeare-but Johns argues these are precisely the kind of issues that require Quaker fingerprints-that require quakering.